MODION® is a compact, modular ion pump system with industrial, laboratory, and cutting-edge scientific applications. Available in pumping speeds of .5 l/s, 1 l/s, 2 l/s, 2 l/s, 3 l/s, 4 l/s, 5 l/s, 6 l/s our ion pumps come with several connection styles to choose from. Whether in orbit, on Mars, or delivering reliable, continuous vacuums in your real world vacuum environment, MODION® provides an exceptional level of product engineering. This small, lightweight ion pump/gauge unit represents a new approach to the familiar appendage pump. Its compact design allows the high voltage modular power supply, ion pump, and the display module to be assembled into a single inter-connected unit with a mass from as low as 318gm, and a size as small as less than 5" in overall length. A four decade, easy to read bar graph meter display and a 0-5VDC analog signal during normal operations, and continuously monitors the level of vacuum within the pump. Visit our Ion Pump Store, or Contact Us today to learn more about MODION® vacuum pump systems. 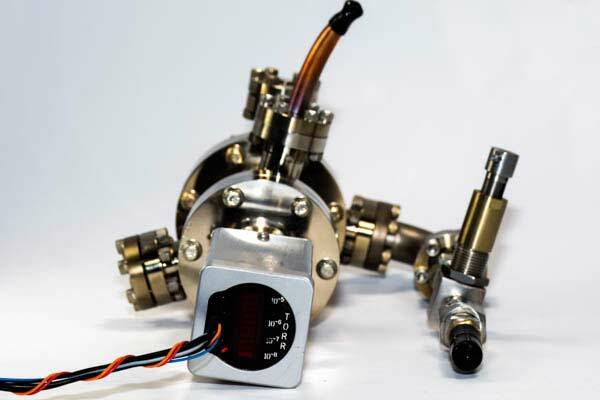 Customized ion pumps and mounting options are available, including space flight qualified units. J.B. Anderson is extremely proud to announce Cosmotec Corporation as the exclusive distributor of MODION® products in Japan! Visit the Cosmotec Corporation website for more info! MODION® Ion Pumps are a product of J.B. Anderson & Son, Inc.. At J.B. Anderson, we pride ourselves on our high quality in-house manufacturing controls. We machine our own hardware and wind our own transformers. MODION® ion pump are manufactured in tolerance under exacting quality control conditions at our USA based facilities, and we've been doing it this way for over thirty years. For more information please contact us at 724-523-9610 to speak with one of our Ion Pump Technicians, or email us at sales@modionvacuum.com.